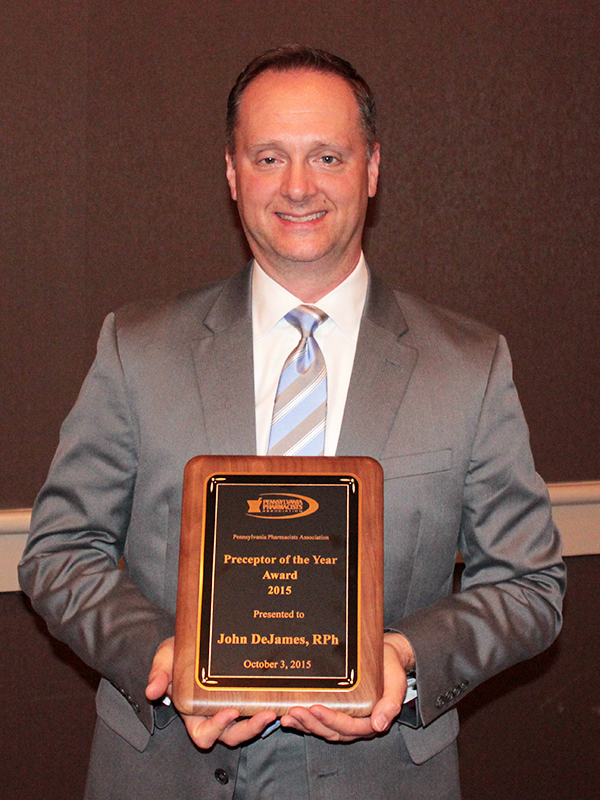 Harrisburg, PA – The Pennsylvania Pharmacists Association (PPA) recently honored John DeJames, RPh with the Preceptor of the Year Award during PPA's 2015 Annual Conference held at the Holiday Inn Harrisburg-Hershey on October 3, 2015, in Grantville, PA. The Preceptor of the Year is nominated by a PPA Student Member, and recognizes a preceptor who goes above and beyond in their training and leadership for their students. A 1988 graduate of Duquesne University Mylan School of Pharmacy, DeJames has always had a love for educating student pharmacists. His dedication to patients and the community have been inspiring to many of his students on rotation. For years, he has been a preceptor that students turn to for advice and knowledge, advising over thirty students a year since 2006. DeJames currently works at Giant Eagle, where he is the Clinical Programs and Special Projects Manager. He manages the payroll budget, overlooks immunizations, and performs medication therapy management. Through these, he has been able to expose students on rotation to management. DeJames also serves on the Dean's Advisory Council for three pharmacy schools: Duquesne University, Neomed, and the University of Toledo. He has worked on expanding student recruitment to many other universities throughout Pennsylvania and its surrounding states. Finally, he serves as a great role model for advocacy of the pharmacy profession. He is an active member in PPA and ACPA, which promote advocacy and education to pharmacists and student pharmacists alike.